Demonstrate new installations to the end user. Register all installations with the manufacturer and gas safe. Carry out annual service and maintenance, specialising in the higher quality and reliability of Vaillant as my preferred boiler of choice but equally Worcester Bosch, for the budget minded go for a biasi or baxi. Install new gas pipework’s internal and external. Replace old barrel gas pipes. Install gas cookers, ovens and grills. 1st and 2nd fix gas for new extensions kitchens. Run new or replace gas supplies to gas fires. Service gas fires, back boilers and fires. Install service and repair gas boilers. Home owner gas safety inspections. Trace find and repair gas leaks. Cap of old redundant or leaking gas pipes and appliances. Register installations with Gas Safe. Boilers in kitchens, under stairs cupboards, airing cupboard, cellars and basements. Flue installation wall and roof. Boiler refit in new positions boilers up to 5yrs old and no warranty on boiler. Vaillant Advanced installer 7yr warranty as standard on all our Vaillant boiler changes up to 10yr boiler warranties for extra payment. We also fit Worcester Bosh, Baxi, Glow Worm, Biasi. If you have a boiler that is 15 yrs. or older you may be thinking great this thing is still going but they are possibly using up to 40% more gas than the more modern condensing boilers even if you are climate change denier you have to consider the savings on the environment and the amount of gas you use. You can even keep the tank and cylinder A lot of people think they have to have a combi not true. Also why wait till your boilers breaks down in the middle of winter and can’t be repaired start saving and planning for its replacement now even if you don’t want it done for a couple of years, it is better to be in a position to get your installer of choice and get a quote, put around £90 a month and in a couple of yrs. you will have saved enough to replace it. Take a look at some of our recent projects from start to finish. 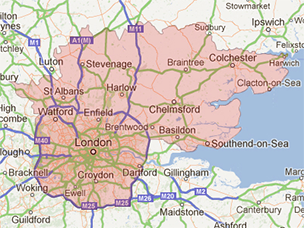 Covering Essex, Herts & North London. Other areas covered on recommendation. Works outside of these times can be arranged but will be at a premium rate.